Other functions: alarm clock, clock, calendar can slide show mode, timer switch, pictures can rotate 360 degrees. Music, movies, play fast but at high magnification in retreat quickly. 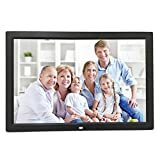 With This 15 inch Multi-functional Digital Photo Frame, you can view your most treasured memories without having to resort to turning on your computer or dealing with countless bulky photo albums. High resolution LED screen offers the viewer a clear and distinct display of all the intricate deails encompassed in each picture. Video playback support RMVB MPEG1 (VCD SVCD), MPEG2 (DVD), MPEG4 (720P RMVB DIVX AVI), etc. All formats. Audio playback support MP3 / WMA format, image browsing support JPEG format. Speaker: built-in speakers, plays MP3 Stereo music in background. Stereo audio output. There are power off memory function. Support USB 1.1 or 2.0 USB interface, can be an external computer or hard disk, USB flash drive. Support with background music (MP3) browse the image feature. Supporting language: Simplified Chinese, English, Spanish, German, French, Italian, etc. Clock, calendar, clock, timer switch machine. Output interface: headphone output interface. External power supply: AC 100 ~ 240V, DC 12V 2A. This entry was posted in Discount Photography and tagged 1280*800, ControllerBlack, Digital, Frame, inch, Lacaca, Media, Photo, Player, Remote, Video by Ball Photo. Bookmark the permalink.